Have you ever wondered how to ensure that your essential oils in cosmetics are legally compliant? It’s a minefield, with different parts of the world adhering to different regulations. The majority of countries follow IFRA, but there are variations around the globe. If you sell cosmetics in different parts of the world (even if that’s through your website), then you need to ensure that you are globally compliant. 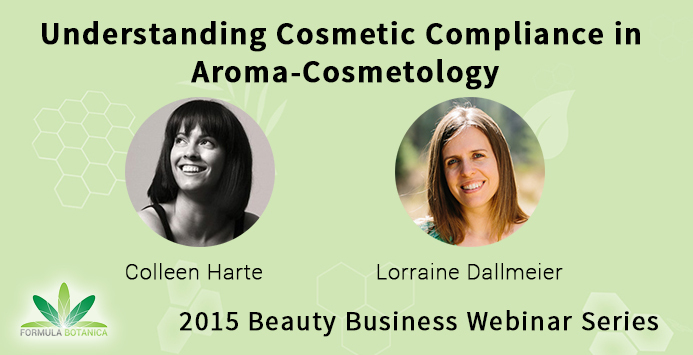 In our upcoming FREE webinar with Colleen Harte from LabAroma on the 28th of October 2015 at 8pm GMT, we will be looking at how to achieve legal compliance for essential oils in your cosmetic formulations. Everyone who registers will be sent the time limited webinar replay. Formula Botanica webinars are always extremely popular and generally attended by 500-600 people. You don’t want to miss out!